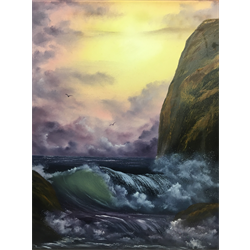 Join us for an afternoon of tranquility and relaxation with Kathryn Wallack as she walks you through the tried and trusted wet on wet style of Bob Ross. Kathryn Wallack is a veteran of 13 years in oil painting with the Bob Ross style. She has had the pleasure of working alongside artists like Glenice Moore, Robert Warren, Ellen Tye and Bill Ridley during her career. Her work even hangs on the walls of Artist’s Emporium itself! 2- Bark and tree textures. 3- Foreground and background layering. 4- Palette and canvas management. 5- Basic brush care skills. Those who register for this class will be entered for a chance to win special giveaway prize! Register for all three of Kathryn’s classes and you’ll be entered for a chance to win $150 Gift Card for Artists Emporium!